Well, for some time now I have wanted a Triumph 900 Scrambler, many times I have looked and pondered more than the French Sculpture in Paris. 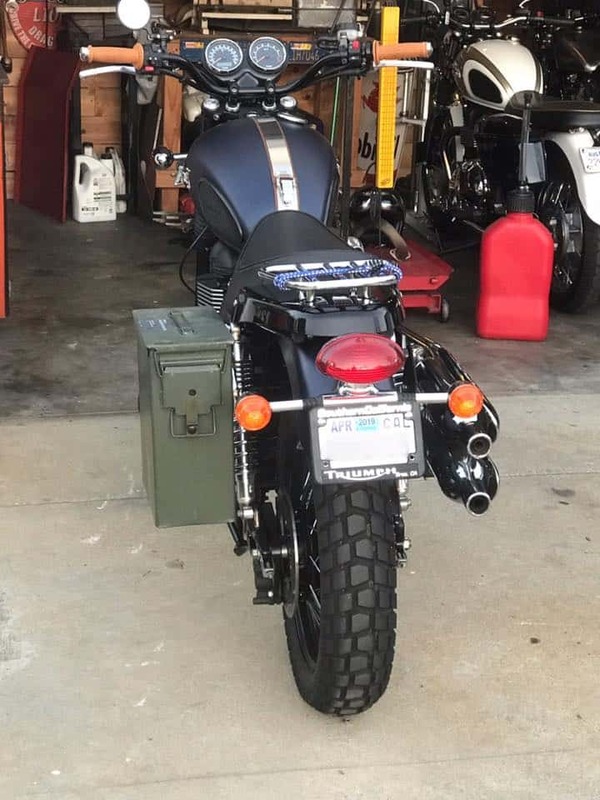 But for some reason I never went ahead and bit the bullet so to speak, but after many years of laying on a gas tank, it was time for a change and for a few reasons too. My girlfriend Jennifer rides a T100 Bonneville and wanted to be on an even par in power and fuel range. 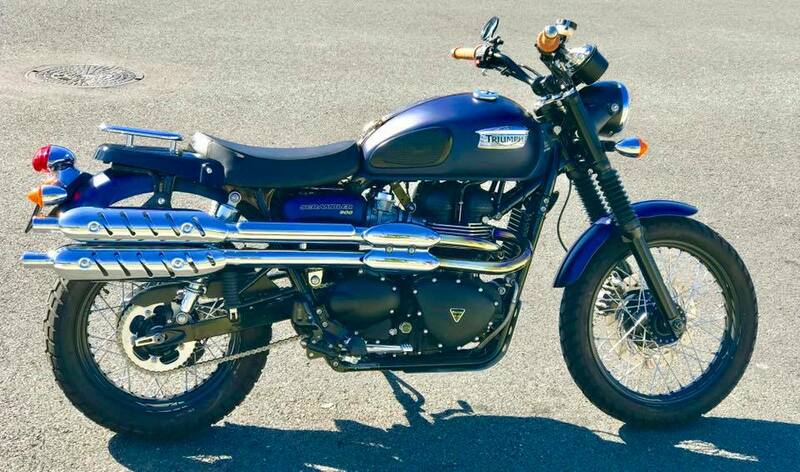 When we last went out Jennifer took in all the sights whilst sat upon her Bonneville, whilst all I saw was either gauges or Apexes of corners coming up etc.So I decided to sell my Thruxton and start to look out for a Scrambler instead. 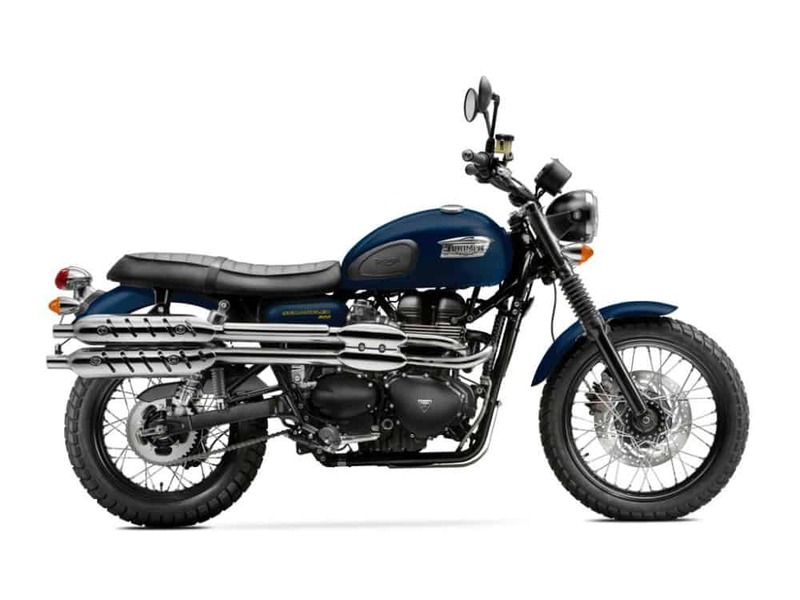 Not long until the Thruxton was Sold, I was already taking a peek at Scramblers, and I first went down to the local Triumph dealer to look at Brand spanking New models. But after having a look, I was not happy with these models as too much cheap arse plastic was put on them, of course the salesman tries to make it sound like a deal but to me it was about as inviting as hemorrhoids. 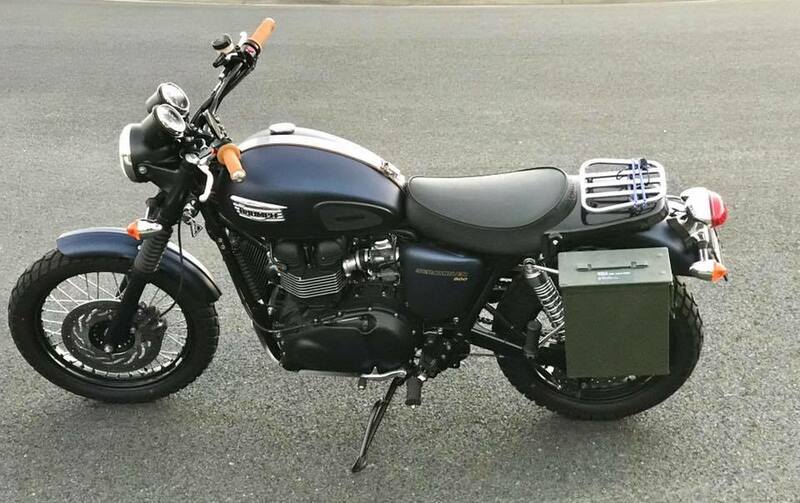 They said if I wait until April, the New Scrambler will be out, they want 2 arms and 3 legs for that, no thanks, as I want an affordable ride and the gauntlet had been thrown as my local dealer didnt want to help at all this time, so feck them, we shall locate our own. I looked at many with Jennifer online, lots were clunkers, broke or beaten up or just had a rough life, I was keen on the matt pearl Blue version but most I looked at were Black, we saw one that was not too bad in the pics, the owner said it was great, so we got up super early, drove for 4 hours only to find a bike that had more issues than a homeless drunk with a meth addiction.I took it for a ride, the chain clunked like an ill fitting chastity belt and the fork seals had blown, as well as brake fluid had spillled at some point in its life and took a few layers of paint off the headstock, what a waste of time, so we jumped in the van and drove all the way home. But at last, Jennifer’s friend she originally went to high School was selling one and just down the road, only to find out I was there in the show room when i originally was looking at bikes and I told him the scrambler was his best bet, so- as he has a ton of bikes and this scrambler had 459 miles on it and of course was pearl matt Blue, a deal was struck and I loaded the bike up into the van and bought it home, well happy. So there it is, as stock as the proverbial rock, and it will not stay like that for too long as I am always thinking of things to do on my own rides and this is no exception. I added a stainless Steel Tank Strap and a new set of grips, but I want the Mirrors and seat gone as thats too stock looking for me. Now thats better, a smaller seat with a Chromed rack to carry stuff, just what I need, I shall re-upholster a little later on though, maybe diamond stitching? 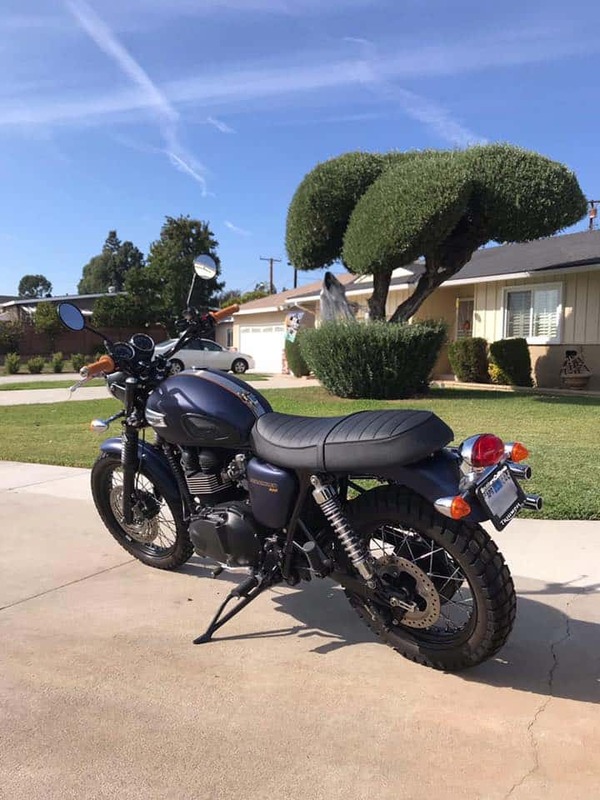 Looks better already and it is a lot of fun riding this Scrambler and I am looking forward to clocking a few miles up on the odometer soon with Jennifer on her Bonneville. Eventually I shall get ride of the exhaust system for something of mine and makes a little bit of noise and more power, but for now its fine. 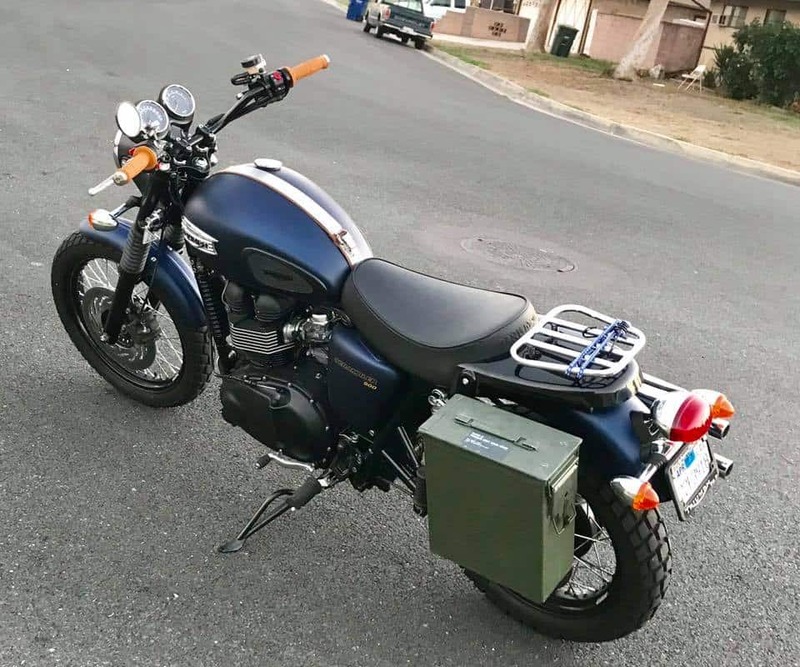 So I can get more things to carry with me when I am on a trip etc, I thought that I would add an Ammo Box as a pannier bag and am happy at how this looks, didnt want a huge version as it would offset the bike too much, but this is perfect to what I need and happy I went ahead and fitted this to the bike. I may make a stencil and paint something on the side, not sure what yet but something to think about and now Ii have somewhere to put my gloves, hat and scarf when we stop. Eventually I shall remove the ugly plastic rear tail light assembly but need to think of something cool first but thats next on the list of modifications I need to complete on this machine. Don’t be fooled by the Scrambler’s retro design because every mechanical detail in it is about as modern as it gets. The tubular steel, twin cradle frame can be clearly seen from a distance, evoking Triumph’s classic style ethos. The exhausts are also prominently shown, extending all the way from the bolted engine under the seat to the rear, just above the 17-inch, 40-spoke wire rear wheel. The pair of Kayabasa chromed shocks at the back of the bike are also easily detectable, adding to the classic look of the bike while also providing a balanced and effective damping, giving riders the confidence to hit the road with the bike’s suspension credentials. A 19-inch 34-spoke wire wheel sits comfortably at the front, wrapped around block-treaded tires to give it the tool it needs to get outstanding on-road performance in any kind of road surface. To keep the Scrambler in tip-top shape, Triumph also installed a single front disc brake and a rear equivalent courtesy of Nissin to help provide stopping power that doesn’t jolt you out of your seat. Instrument display and functions Analogue speedometer with odometer and trip information. 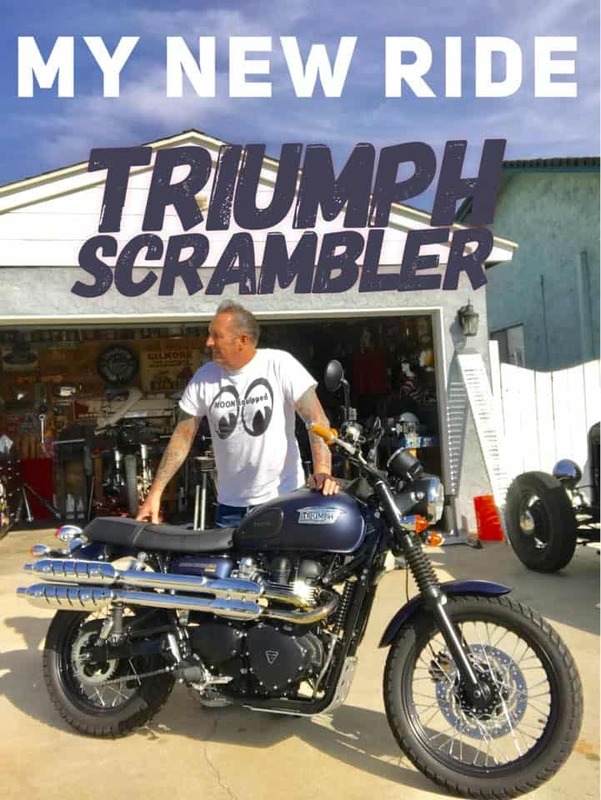 The Triumph Scrambler is powered by a Bonneville-based 865 cc, air-cooled, eight-valve engine that develops 58 horsepower and 50 pound-feet of torque at 4,750 rpm and mated to a five-speed transmission. 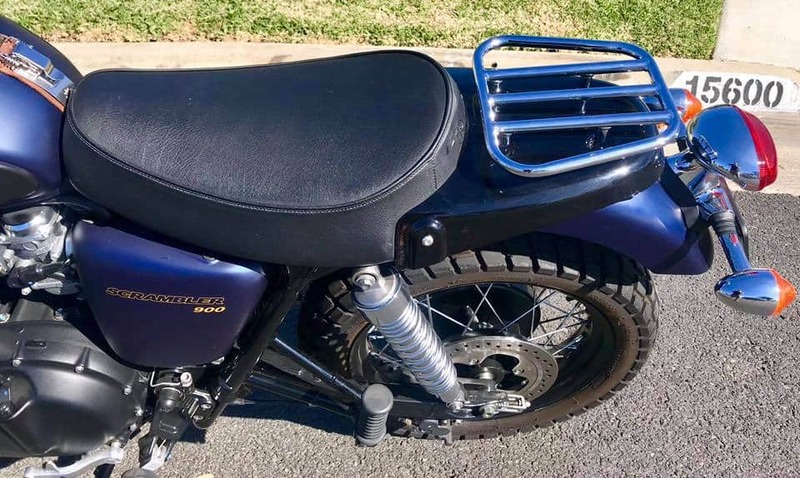 Move to the back and you’ll see a pair of twin chromed stainless steel exhaust pipes and heat shields that not only serve their mechanical purposes of meeting noise emission regulations but also pays homage to the 1960s Triumph TR6C Trophy Special. The engine itself doesn’t have crazy numbers, but it does have enough to give riders all sorts of fun when prowling the road. The Scrambler is capable of covering 0 to 60 mph in 6.2 seconds to go with a top speed of 125 mph. It’s also the most fuel efficient engine in the Triumph range, allowing the Scrambler to cover as much as 72 mpg. 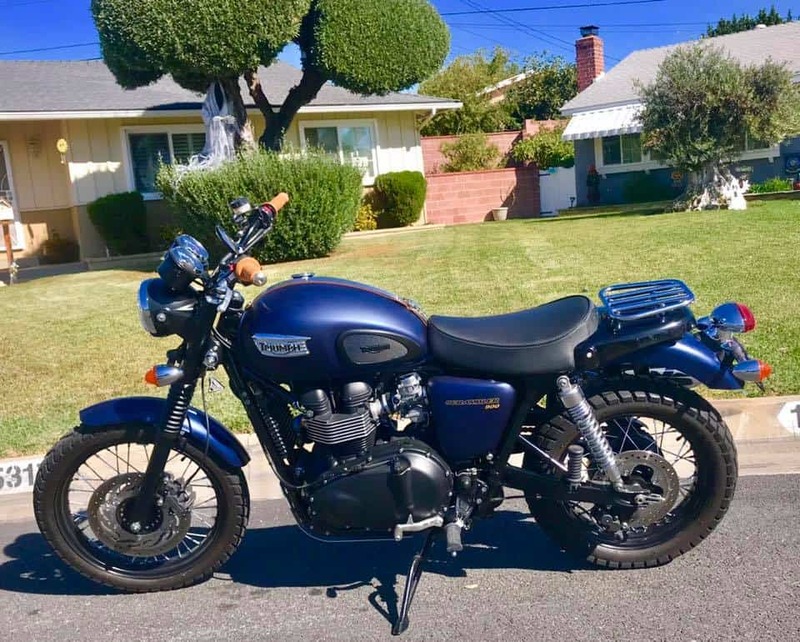 This entry was posted in Blog and tagged 2015 Triumph scrambler, 2016 triumph, 900 scrambler, 900 Triumph, 900 Trumpy, ammo box, brit iron, custom bikes, home build, modifications, pearl matte blue, scrambler, triumph, twinline. Norton Reveals Two New Motorcycles.